The Achaemenid or Persian empire was founded by Cyrus the Great, who became king of Persia in 559 BCE and defeated his overlord Astyages of Media in 550. Its formation began in 550 B.C., when King Astyages of Media, who dominated much of Iran and eastern Anatolia (Turkey), was defeated by his southern neighbor Cyrus II (“the Great”), king of Persia (r. 559-530 B.C.). 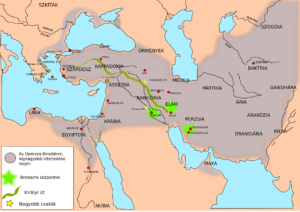 Under Darius, the empire was stabilized, with roads for communication and a system of governors (satraps) established. He added northwestern India to the Achaemenid realm and initiated two major building projects: the construction of royal buildings at Susa and the creation of the new dynastic center of Persepolis, the buildings of which were decorated by Darius and his successors with stone reliefs and carvings. After the death of Darius I in 486 B.C., his son, and successor, Xerxes, was chiefly occupied with suppressing revolts in Egypt and Babylonia. In his conquest of the Greek Peloponnesus, his vast army defeats the Spartans at Thermopylae and sacks a deserted Athens. The naval defeat at Salamis and the armies destruction at Plataea stopped the western expansion of the Persian Empire and were the high tide mark of the Achaemenid empire. Capable generals like Mardonius added new countries to the empire, which now extended from Macedonia in the west to Pakistan in the east, and from the river Syr Darya and the Caucasus mountains in the north to the Libyan desert and the Persian Gulf in the south. 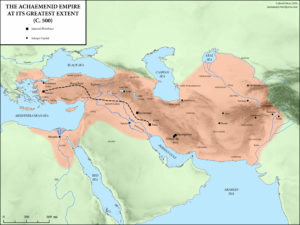 The Persian Empire Achaemenids built an efficient infrastructure of roads and ports. They bought water in remote areas throughout the empire through the use of qanats, (underground irrigation system). Darius the Great, had a canal built to link the Nile to the Red Sea (an early precursor of the Suez Canal). After the death of Darius II, civil war broke out between Artaxerxes II Mnemon and his younger brother Cyrus, who marched with an army of Greek mercenaries to the east, but was defeated at Cunaxa near Babylon. Cyrus the Great, issued a decree, later hailed as his charter of the rights of nations and inscribed in cuneiform on a clay cylinder. It is referred to as the first declaration of Human Rights and is now kept at the British Museum. A replica is also on display at the United Nations in New York. In 331 B.C., when Alexander the Great defeated a huge Persian army at the Battle of Arbela (Battle of Gaugamela) and with the death of Darius III shortly after, the Achaemenid empire came to an end and Persia became part of Alexander’s empire.